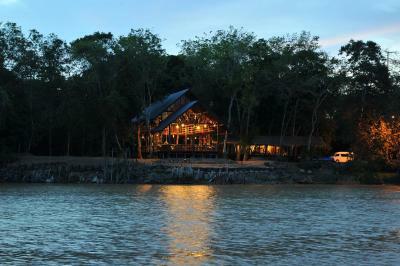 Lock in a great price for Borneo Natural Sukau Bilit Resort – rated 8.7 by recent guests! 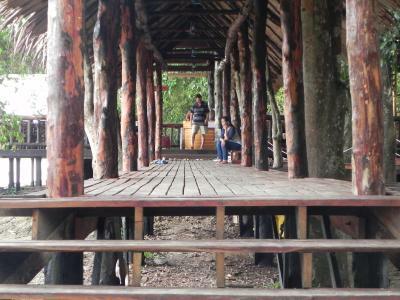 This was by far the highlight of our trip to Sabah, which is a great place to visit. 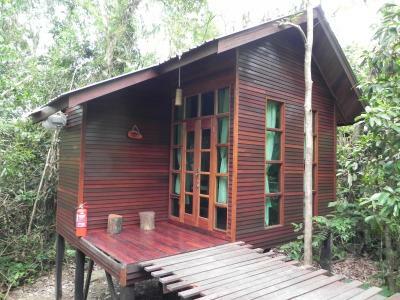 Borneo Natural Sukau Bilit Resort was out of this world. Great facilities and food. The chalets are really great! Fred is the main host, and he is fantastic. We noted that the whole operation is down to his attention to detail and very hard work. He made us feel like we were the most important guests that had ever visited. A very kind man as well. The river cruises are incredible, and our main guide was Allen, who also made our experience top notch. The rest of the hosts and hostesses were also great. This is a resort that is not to be missed! 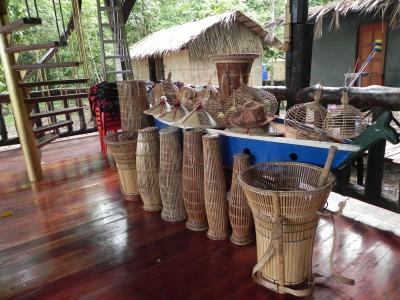 The staff was super friendly, the guides super knowledgeable. 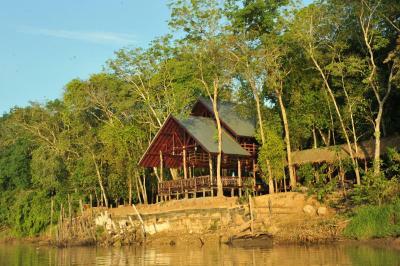 The food was better than expected, the rooms were clean and cozy, the nature walks and wildlife boat tours exciting. 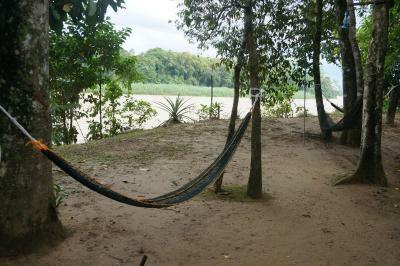 The common area was open and a great place to relax with a book in a hammock and look out over the river and forest. Trip of a lifetime. 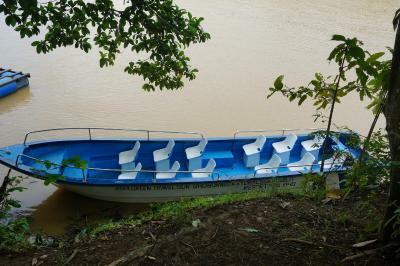 -I booked through booking.com and I had all private tours and a 6 seater boat for booking.com guests. The other guests shared a boat with 25 people. 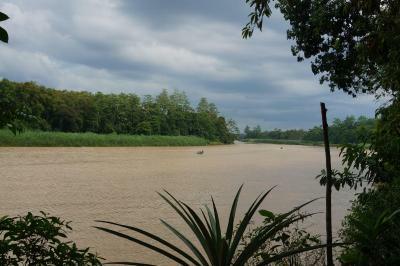 - We saw wild orangutans, proboscis monkeys, hornbills, flying Fox... The list goes on. The staff were excellent- attentive and very helpful. Amazing experience. I didn't want it to end. Great itinerary of activities as we were only there for one night and and day. Unfortunately it rained the entire time but still enjoyable! 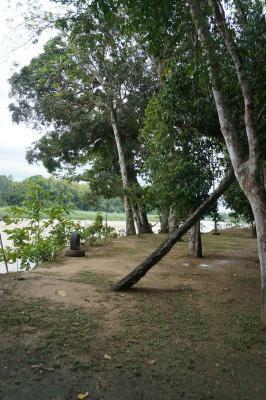 Saw Hornbills, Pigmey (spelling?) elephants, an Orang-utan~ pretty amazing experience! 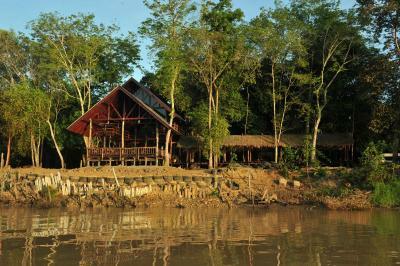 An awesome stay at Borneo Natural Sukau! Our guide Kairol was amazingly patient and had a superhuman ability to spot animals. He even found us a Pygmy elephant! A great comfortable stay, all the staff were friendly and accommodating. The rooms were beautiful! 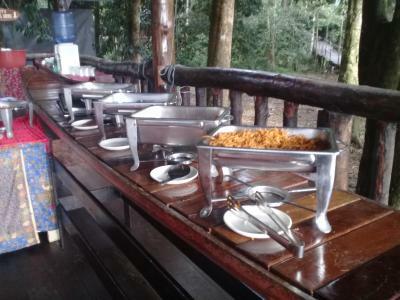 You get to enjoy the facilities provided for the lodges, ie the nice garden and breakfast buffet (included in the price). Staff was very helpfull! Our entire stay was really great. The staff was really helpful and so nice. 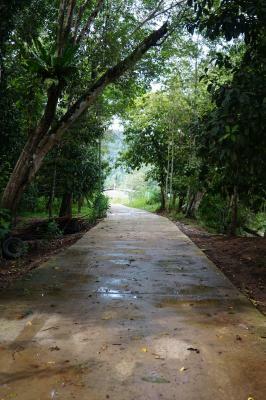 The guides had a lot of information about the jungle. The food was good, but little variation. That's something you get when you're staying in the jungle I guess. Special thanks to Ryan for sharing all his knowledge with us. You should do this! 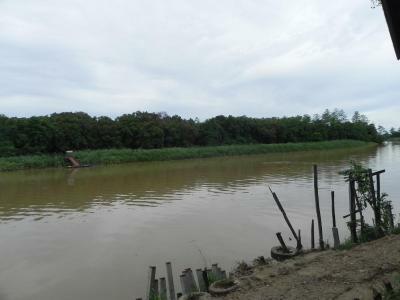 The boat tours and the walks were very interesting and we saw lots of animals - monkeys, cibet cats, crocodiles, hornbills and many more... Our guide, Ryan, was very friendly, knowledgeable and made this a very special experience. Thank you very much! 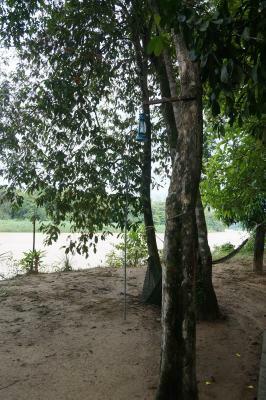 We also went to the Bako National Park near Kuching, but at Kinabatangan river you see so much more! The AC in the room worked very well and quietly. 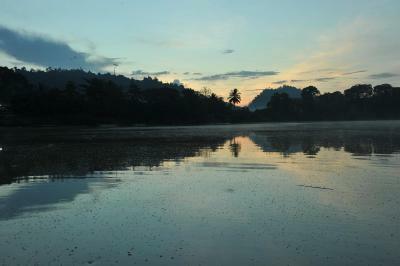 The transfers to and from the resort were very well organized, comfortable and in time. Very friendly staff. Great to meet other travellers. 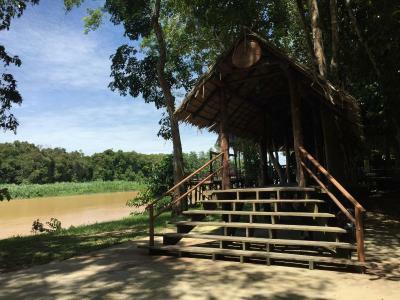 Nestled along the bank of the Kinabatangan River and tropical lush greenery, the Borneo Natural Sukau Bilit Resort is an eco-resort located in the village of Bilit, Malaysia. 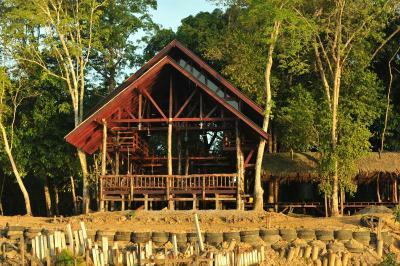 The resort and its rooms rest above 4 feet wooden stilts that rise among the forest, linked together by a series of boardwalk. 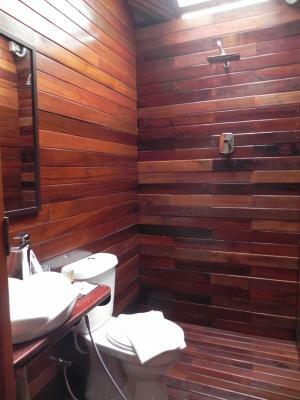 All rooms in the property feature wooden décor that were hand-crafted by the local tradesmen using the Borneo Iron Wood, a rare timber tree that is native to Borneo. 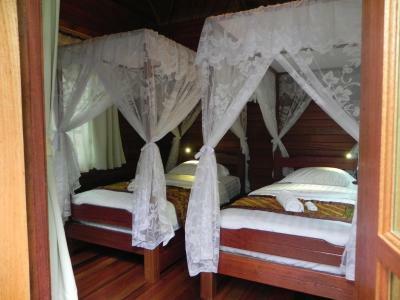 Each room also comes equipped with its own balcony. 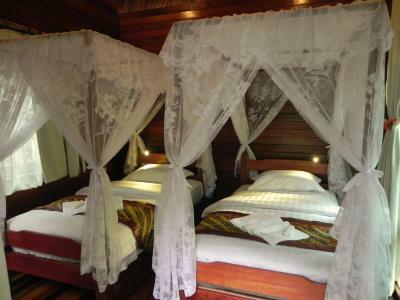 The rooms also come equipped with air conditioning, a ceiling fan and a mosquito net. 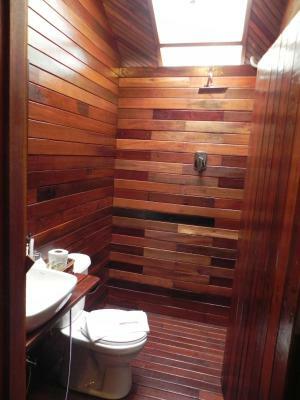 The private bathrooms come with cold and hot showers. 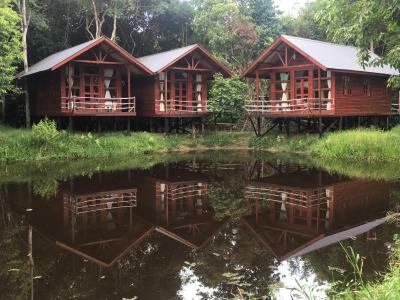 Guests are able to have opportunities to encounter all kinds of flora and fauna that range from the proboscis monkeys, the oriental darters and even the pygmy elephants during their stay. 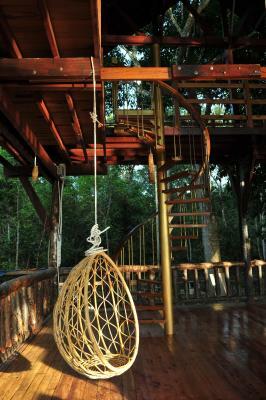 The resort is located approximately a 2.5 hour drive away from Sandakan. 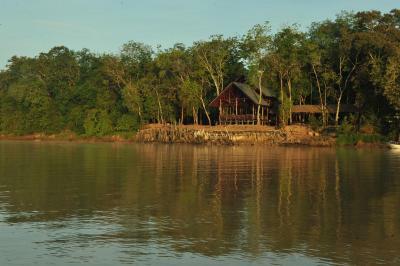 When would you like to stay at Borneo Natural Sukau Bilit Resort? Rooms are cooled with a fan, and include a desk and clothes rack. 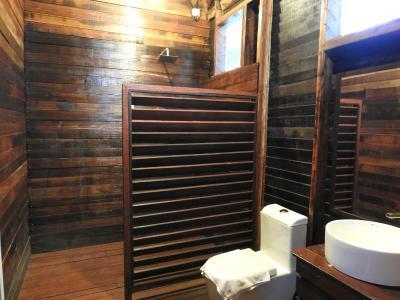 Guests have access to a shared bathroom with shower facility. 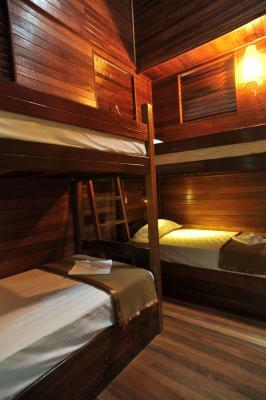 Rooms are cooled with an air condition and a fan, and include a desk and clothes rack. 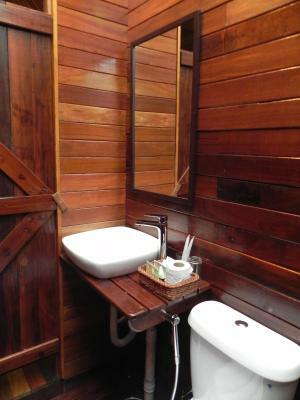 Guests have access to a private bathroom with shower facility. Rooms are cooled with an air condition, fan, and include a desk and clothes rack. 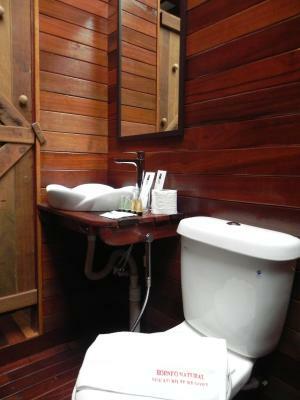 Guests have access to a private bathroom with shower facility. Rooms are cooled with an air conditioner and fan. They include a desk and clothes rack. 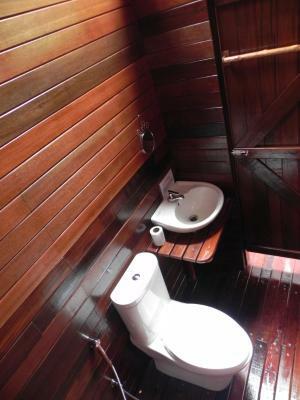 Guests have access to a private bathroom with shower facility. 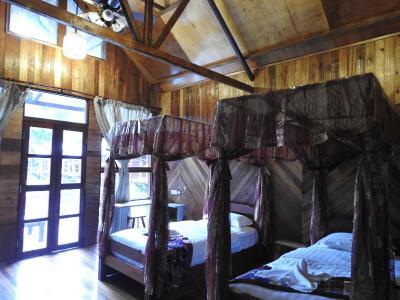 This chalet features a balcony, air conditioning and tumble dryer. 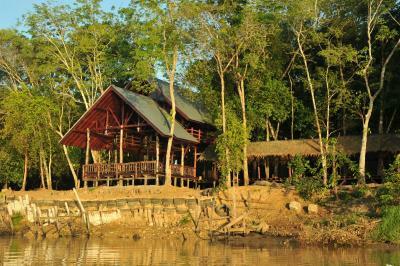 Borneo Natural Sukau Bilit Resort is a naturally splendid eco-resort in the village of Bilit. 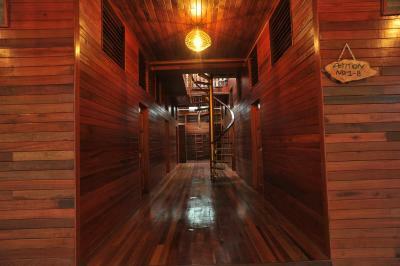 It comprises of 23 rooms which handcrafted using Borneo Iron Wood. 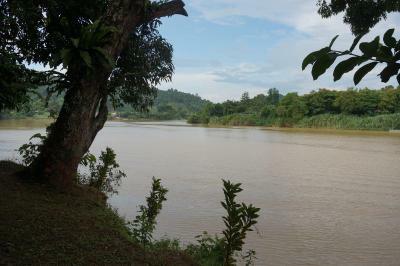 This resort surrounded by local village and is nestled along the Kinabatangan river. 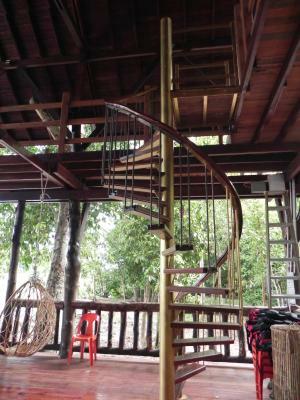 House Rules Borneo Natural Sukau Bilit Resort takes special requests – add in the next step! Debit card Other Borneo Natural Sukau Bilit Resort accepts these cards and reserves the right to temporarily hold an amount prior to arrival. Borneo Natural Sukau Bilit Resort accepts these cards and reserves the right to temporarily hold an amount prior to arrival. 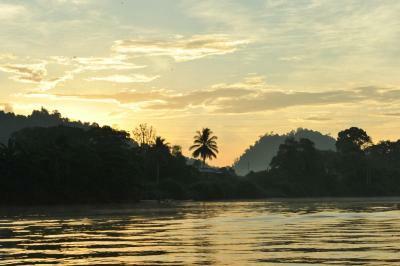 Please inform Borneo Natural Sukau Bilit Resort of your expected arrival time in advance. You can use the Special Requests box when booking, or contact the property directly using the contact details in your confirmation. There is nothing that we would change! 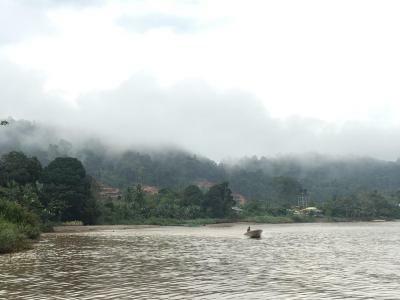 If we had to complain about anything it would be that in our booking it said they would drop us off at our hotel in Sandakan, but they dropped us in the city center. 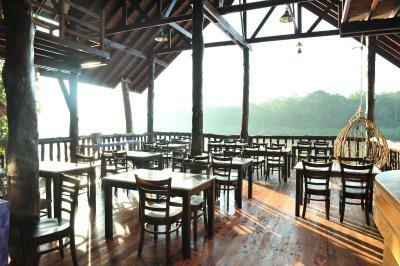 "Resort" gives a little wrong impression - the food and the overall standard is more that of an hostel. 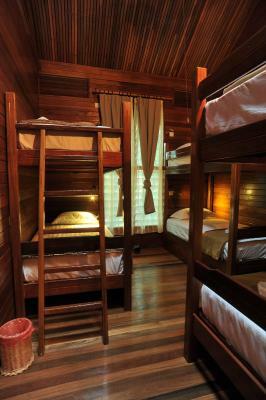 So in my opinion it is a little overprized (at least if you don't stay in the dorm, but in your own bungalow as we did). On the other hand the tours are really good. So the overall value is okay. The roof of the public toilet next to the restaurant is broken and practically non-existant. So whenever it's raining (and afterwards), you can't use it (or at least it is quite disgusting). They really have to fix the roof. If you stay 2 nights your room is not cleaned after the first night. Needs a bit of tweaking, e.g. chairs in the room . Good value as a whole package. 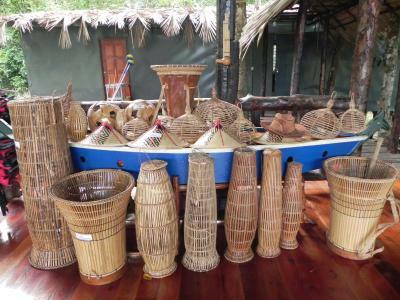 You have food ,boat trips and jungle walks with a guide.we had born bon . Knows all about the animals and if you are interested he will explain history and is a wealth of knowledge. Most staff were really helpful- Diddi? The main tour guide was your main asset and she made a huge difference to our trip! Everything was perfect. Could do with chairs in the room which could also be used on the deck. 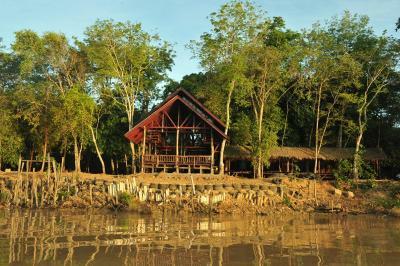 Accommodation excellent, very clean, food good, set mealtimes and activities like the river trip at 0600 hours each morning and the rainforest hike. 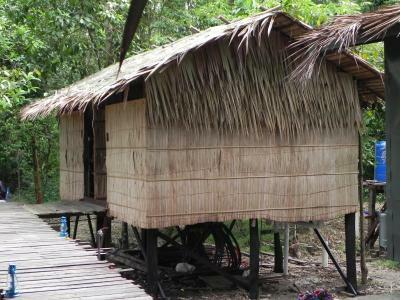 Location excellent, guide brilliant and transport to and from Sandakan was perfect. And the animals, particularly the monkeys were naughty but great. 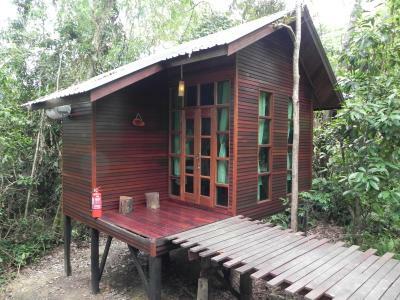 Of course we realise the place is in the middle of the jungle but there was some sort of rodent scratching around the ceiling inside the house and waking us up. Absolutely amazing guides, great hospitality. Just everithing! 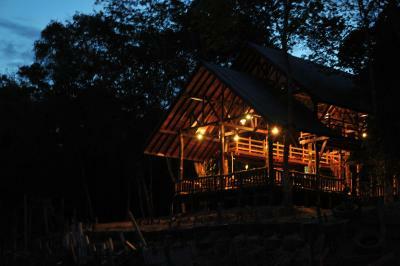 One of the best lodge i ever visited! 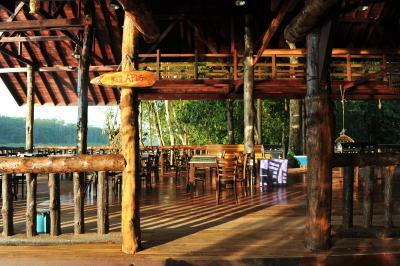 Really nice place with friendly and helpfull staff.